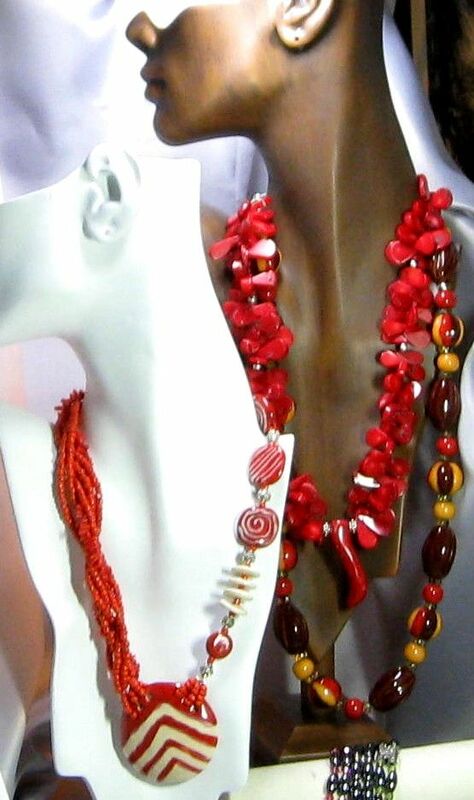 Designer Beaded Jewelry Handcrafted Necklaces with WOW. Beaded Necklaces Something for Every Gal. Copper Handcrafted Necklaces, Big and Bold Handmade Necklaces, Statement Necklaces, Bead and Wire Necklaces, Classic Pendant Necklaces, Pearl Necklaces, Gem Stone Necklaces, European Style Pandora Necklaces, Beaded Necklaces and much much more all handcrafted and handmade. Handmade Necklaces in classic black and white, Necklaces in blues, turquoise, beige, pink and rose even necklaces in vivid red, deep blue and imperial purple. Swarovski Crystals Necklaces with lots of sparkle. Gemstone necklaces and handmade artisan lampwork glass bead necklaces. All VP's Jewelry Necklaces have 14K gold filled, sterling silver or copper clasps and ascents. Necklaces made with gemstones like amazonite, apatite, sodalite, jade, jasper, turquoise, artisan lampworks glass bead and much more.